The Day the Earth Stood Still is a 2008 American science fiction thriller film, a loose adaptation of the 1951 film of the same name. The screenplay by David Scarpa is based on the 1940 classic science fiction short story "Farewell to the Master" by Harry Bates and on the 1951 screenplay adaptation by Edmund H. North. Directed by Scott Derrickson and starring Keanu Reeves as Klaatu, this version replaces the Cold War theme of nuclear warfare with the contemporary issue of humankind's environmental damage to the planet. It follows Klaatu, an alien sent to try to change human behavior or eradicate humans from Earth. The film was originally scheduled for release on May 9, 2008, but was released on a roll-out schedule beginning December 12, 2008, screening in both conventional and IMAX theaters. The critical reviews were mainly negative, with 186 reviews collected by Rotten Tomatoes showing only 21% of them were positive; typically the film was found to be "heavy on special effects, but without a coherent story at its base". In its opening week, the film took top spot at the U.S. box office and went on to gross over $233 million worldwide. The Day the Earth Stood Still was released on home video on April 7, 2009. In the present day, a rapidly moving object is detected beyond Jupiter's orbit and forecast to impact Manhattan. It is moving at 30,000 kilometers per second, enough to destroy all life on Earth. The United States government hastily assembles a group of scientists, including Dr. Helen Benson and her friend Dr. Michael Granier, to develop a survival plan. As it nears the planet, the object slows down just before impact. Revealed to be a large spherical spaceship, it lands gently in Central Park and is quickly surrounded by NYPD and heavily armed US military forces. An alien emerges and Helen moves forward to greet it; but amidst the confusion, the alien is shot. A gigantic robot appears and temporarily disables everything in the vicinity before the wounded alien voices the command "Klaatu barada nikto" to shut down the robot's defensive response. The alien's exterior is found to be a bioengineered space suit, composed of placenta-like material covering a human-like being. The being quickly ages into Klaatu, who looks like the mountaineer from 1928. Klaatu informs Secretary of Defense Regina Jackson that he is a representative of a group of civilizations, sent to talk to the leaders of Earth about saving the planet. When Jackson instead sends him to be interrogated, Klaatu escapes and reconnects with Helen and her stepson, Jacob, telling them that he must finish his mission to "save the Earth". The presence of the sphere, and other smaller ones that begin to appear all over the world, causes widespread panic. The military launches a drone attack on the Central Park sphere, but are thwarted by the robot. The military takes a weapons-free approach, cautiously enclosing the robot, soon nicknamed "GORT" (for Genetically Organized Robotic Technology), and transporting it to Mount Weather, an underground facility in Virginia. Klaatu meets with another alien, Mr. Wu, who has lived on Earth for 70 years. Wu tells Klaatu that he has found the human race to be destructive, stubborn and unwilling to change, which matches Klaatu's experiences. Klaatu orders the smaller spheres to collect specimens of animal species, to preserve them for later reintroduction to the Earth. He clarifies for Helen that he means to save the Earth from destruction by humankind. When a policeman attempts to take them into custody, Klaatu kills him then promptly revives the officer, telling Helen and Jacob that he did this to simply disarm an obstacle to his mission. Hoping to persuade Klaatu to change his mind about humanity, Helen takes him to the home of Professor Barnhardt, a Nobel Prize winner. They discuss how Klaatu's own race went through a drastic, collaborative evolution to prevent the demise of their own planet. Barnhardt pleads that Earth is at the same precipice, and humanity should be given a chance to understand that it too must change. While the adults are talking, Jacob calls the authorities to come and arrest Klaatu. The military capture Helen while Klaatu and Jacob escape on foot. As they travel, Klaatu learns more about humanity through Jacob. When Jacob contacts Helen and arranges to meet at his father's grave, the Secretary sends her to try to change Klaatu's mind. At the grave, Jacob is heartbroken that Klaatu cannot resurrect his long dead father. As Helen and Jacob have a tear-filled reunion, Klaatu's cumulative observations of humans convinces him to stop the swarm. Dr. Granier drives them to the Central Park sphere, but the swarm has reached massive proportions. Klaatu trudges through the swarm to the sphere, touching it moments before his own body is consumed. The sphere deactivates the swarm, saving humanity, but at the expense of electrical activity on Earth, per Klaatu's warning that there will be "a price to the [human] way of life." The giant sphere leaves the Earth. Keanu Reeves as Klaatu, an alien messenger in human form. Reeves dislikes remakes, but was impressed by the script, which he deemed a reimagining. He enjoyed the original film as a child and became fonder of it as an adult when he understood how relevant it was. Reeves acknowledged his Klaatu is "inverted" from the original, starting "sinister and tough" but becoming "more human," whereas the original was "more human than human" before revealing his "big stick" in his ending speech. He compared the remake's Klaatu to the wrathful God who floods the world in the Old Testament, but is gentle and forgiving by the time of the New Testament. He spent many weeks advising the script, trying to make Klaatu's transition from alien in human form to one who appreciates their emotions and beliefs subtle and nuanced. Derrickson, the director, said that although Reeves would not use actions "that are highly unusual or highly quirky," he nevertheless "keeps you aware of the fact that this being you're walking through this movie with is not a human being." At Reeves' insistence, the line "Klaatu barada nikto" was added to the script after initially being omitted. The line was recorded many times, and it was decided to combine two recordings: one where Reeves said it normally, and a reversed version where he said the line backwards, creating an "alien" effect. Jennifer Connelly as Helen Benson, an astrobiologist at Princeton University who is recruited by the government to study Klaatu. Connelly was Derrickson's first choice for the part. She is a fan of the original film and felt Patricia Neal's original portrayal of Helen was "fabulous," but trusted the filmmakers with their reinterpretation of the story and of Helen, who was a secretary in the original. Connelly emphasized that Helen is amazed when she meets Klaatu, as she never believed she would encounter a sentient alien like him after speculating on extraterrestrial life for so long. Connelly was dedicated to understanding her scientific jargon, with Seth Shostak stating she did "everything short of writing a NASA grant application." Jaden Smith as Jacob Benson, Helen's eight-year old stepson. Jacob replaces the character of Bobby (Billy Gray) in the original, and his relationship with Helen was written as a microcosm of how Klaatu comes to see humanity – the alien sees their cold and distant relationship as normal human behavior, and their reconciliation forces him to change his mind. Smith said he found Jacob difficult to play because he felt the character "opposite" to his personality. Smith had met Reeves before on the set of The Matrix sequels, which featured his mother Jada Pinkett-Smith. John Cleese as Professor Karl Barnhardt, a Nobel Prize-winning physicist who specializes in the evolutionary basis of altruism. Helen takes Klaatu to him to further change his mind. The role was the most difficult to cast, and eventually the filmmakers decided to approach Cleese, noting "Who would you rather make the argument [to Klaatu] for mankind than John Cleese?" Stoff, a producer, had met Cleese a few times beforehand and had noted his intellect. The actor was surprised the filmmakers were interested in him, and decided playing a dramatic role would be easier than to play a comedic one at his age. He was often reminded to speed up his dialogue so that Reeves would not appear in synchronity with normal human speech patterns. Cleese said he is not interested in extraterrestrial life because he often philosophizes about the purpose of life and why humans are distracted by trivial matters. Cleese spoke about portraying abilities outside his own experience in the scene in which Klaatu corrects a complex mathematical formula Barnhardt has written on a blackboard: "The trouble is, I had to be able to write the equation, because Barnhardt has been working on it for 60 years. I learned to carefully copy things down that mean nothing to me at all. In A Fish Called Wanda, I spoke a lot of Russian without having any idea what it means." The crew enjoyed working with Cleese and were sad when he finished filming his part. Jon Hamm as Dr. Michael Granier, a NASA official who recruits Helen into his scientific team investigating Klaatu. Granier is fascinated by Klaatu, but is torn between his official obligation to detain the alien and protect his country. Hamm acknowledged science fiction was a niche genre when the original film was made, and that it used science fiction to make topical issues more approachable. Hamm had the same feelings for this remake. Originally, Hamm's character was French and named Michel. Although he is interested in math and science, Hamm found his technical dialogue difficult and had to film his lines repeatedly. Kathy Bates as Regina Jackson, the United States Secretary of Defense. Bates had only two weeks to film her scenes, so she often requested Derrickson act out her lines so she would directly understand his aims for her dialogue, rather than interpret vague directions. In 1994, 20th Century Fox and Erwin Stoff had produced the successful Keanu Reeves film Speed. Stoff was at an office at the studio when he saw a poster for the 1951 film The Day the Earth Stood Still, which made him ponder a remake with Reeves as Klaatu. By the time David Scarpa started writing a draft of the script in 2005, Thomas Rothman was in charge of Fox and felt a responsibility to remake the film. Scarpa felt everything about the original film was still relevant, but changed the allegory from nuclear war to environmental damage because "the specifics of [how] we now have the capability to destroy ourselves have changed." Scarpa noted the recent events of Hurricane Katrina in 2005 informed his mindset when writing the screenplay. He scrapped Klaatu's speech at the conclusion of the story because "audiences today are [un]willing to tolerate that. People don't want to be preached to about the environment. We tried to avoid having our alien looking out over the garbage in the lake and crying a silent tear [from the 1970s Keep America Beautiful ads]." Director Scott Derrickson admired the original film's director Robert Wise, whom he met as a film student. He generally dislikes remakes, but he enjoyed the script, which he decided was a retelling of the story and not a true remake. He also explained that The Day the Earth Stood Still is not a widely seen classic film, unlike The Wizard of Oz, which he would not bother remaking. Derrickson's benchmark was Philip Kaufman's 1978 remake of Invasion of the Body Snatchers. Klaatu was made more menacing than in the original, because the director felt he had to symbolize the more complex era of the 2000s. There was debate over whether to have Klaatu land in Washington, D.C., as in the original; but Derrickson chose New York City because he liked the geometry of Klaatu's sphere landing in Central Park. Derrickson also did not write in Gort's original backstory, which was already absent from the script he read. He already thought the script was a good adaptation and didn't want the negative connotations of fascism from the original film. Astronomer Seth Shostak served as scientific consultant on the film, reviewed the script several times for errors, gave suggestions for making the scientists appear less dry, and noted that they would refer to one another on a first-name basis. He said, "Real scientists don't describe an object entering the solar system as 'notable for the fact that it was not moving in an asteroidal ellipse, but moving at nearly three times ten to the seventh meters per second.' More likely, they would say that there was 'a goddamned rock headed our way!'" Filming took place from December 12, 2007, to March 19, 2008, at Vancouver Film Studios, Vancouver Forum, Deer Lake, Jericho Park, and Simon Fraser University. The film was originally scheduled for release on May 9, 2008, but it was delayed until December 12, 2008, because filming commenced later than scheduled. By the time preproduction had started, Scarpa had written 40 drafts of the script. The film was mostly shot on sets because it was winter in Vancouver. Derrickson was fascinated by color schemes. He chose blue-green and orange as the primary colors for The Day the Earth Stood Still. The missile silo converted by the military for experimenting on Gort emphasized gray and orange, which was inspired by an image of lava flowing through a gray field. Derrickson opted to shoot on traditional film, and rendered the colors in post-production to make them more subtle, for realism. To film Barnhardt and Klaatu writing equations on a blackboard, general relativity sums were drawn by Marco Peloso from the University of Minnesota and William Hiscock of Montana State University in faint pencil marks. Keanu Reeves and John Cleese drew over these in chalk. As Fox had a mandate to become a carbon neutral company by 2011, The Day the Earth Stood Still's production had an environmentally friendly regimen. "Whether it was because of this movie thematically or it was an accident of time, there were certain things production-wise we've been doing and been asked to do and so on," said Erwin Stoff. To prevent the wasting of paper, concept art, location stills and costume tests were posted on a website created by the production for crew members to reference. Costumes were kept for future Fox productions or given to homeless shelters, rather than thrown away. Hybrid vehicles were used and crew members had orders to turn off their car engines if they sat in their vehicles for more than three minutes. Weta Digital created the majority of the effects, with additional work by Cinesite and Flash Film Works. The machines of Klaatu's people have a biological basis rather than a mechanical one, as Derrickson theorized that their mastery of ecology would demonstrate their level of sophistication. Derrickson deemed a modern audience would find the original's flying saucer amusingly obsolete and unique to the original's milieu. The director also noted that the original The Day the Earth Stood Still had influenced many films, so his technicians needed to bring new ideas to the remake. The effects team approached the new spacecraft's design as inter-dimensional portals resembling orbs. The script had specified the inside of the orbs as a "white limbo-y thing", but visual-effects consultant Jeff Okun explained this was deleted for being too "cheesy". Derrickson felt not showing the inside of the ship, unlike the original, would make the audience more curious. As well as computer-generated spheres—such as Klaatu's 300-foot (91 m) ship, or a 3,000-foot (910 m) tall orb that rises from the sea—700-pound (320 kg) spheres, 9 feet (2.7 m) in diameter, were sculpted by Custom Plastics, which built spheres for Disney theme parks. The spheres were split in two to make transportation easier. It was difficult placing lights inside them without making them melt. The visual-effects team looked at natural objects, including water droplets and the surfaces of Jupiter and Saturn for the spheres' texture. Derrickson emphasized a Trinity-like relationship between the sphere, Klaatu, and Gort. Klaatu is initially depicted as a radiant focus of sentient light. He is then depicted as a 7-foot-tall (2.1 m) gray "walking womb" shape which finally takes on a completely human appearance. The filmmakers conceived the transitional form because they pondered the idea of humans mistaking space suits for alien skin. Computer-generated imagery and practical effects achieved the transformation. Todd Masters (Slither) directed the creation of the alien form, using thermal plastic and silicone. The script described Gort as nanotechnology by the time the director signed on, although it did not specify Gort's appearance. The 15th draft of the script had depicted the robot as a four-legged "Totem" that stands upright after firing its weapon beam. Okun explained there were many more "horrific" or "amazing" concepts, but it made sense that the robot would assume a familiar human shape. He cited the Monolith from 2001: A Space Odyssey as an inspiration for Gort's texture, noting "it's a simple shape, it has no emotion [...] it just simply is", which makes Gort more frightening because the audience cannot tell what he is thinking. The animators estimated the computer-generated robot as 28 feet (8.5 m) tall, whereas in the original he was played by the 7-foot-7-inch (2.31 m) tall Lock Martin. Gort's computer model was programmed to reflect light, and the filmmakers spent time on motion-capture sessions to guide the performance. An actor wore weights on his hands and feet, allowing the animators to bring a sense of weight and power to Gort. His destructive capabilities were based on locust swarms, although the idea of metal-eating insects goes back to Stephen Vincent Benét's 1933 poem "Metropolitan Nightmare". The Day the Earth Stood Still: Original Motion Picture Soundtrack was orchestrated and conducted by Timothy Williams. Tyler Bates was brought in to compose the score for The Day the Earth Stood Still after Derrickson heard his work on The Devil's Rejects and Slither. Instead of imitating the original score by Bernard Herrmann, Bates decided to try to convey the updated message of the new film, and he assumed that most people would not even realize it was a remake. Bates said, "People revere an original property and feel that it's sacred, but frankly, there's a good story to be retold, as it applies to the climate of the world now. If that's something beyond the scope of a person's ability to take in, on a new level, without necessarily using the original as a criteria for whether or not they're going to enjoy it, then they probably shouldn't bother themselves with it." The origins for the sound on the new score came from Bates attending the filming of a few scenes with Reeves and Smith. When he got back to L.A., he created a sound loop on his GuitarViol to which Derrickson responded, "I think that's the score! ", when it was played for him. Bates utilized the theremin, which Herrmann heavily used for the original film's score. Bates and the theremin player he hired used the instrument in a manner reminiscent of a sound effect, especially during Klaatu's surgery. A short segment from Bach's Goldberg Variations is heard playing in the background of the Professor's home when Klaatu visits the Professor which was not included in the film's accompanying soundtrack release. Before its release, The Day the Earth Stood Still was nominated for Best Visual Effects and Best Sound at the 2008 Satellite Awards. On the film's December 12, 2008 release, the Deep Space Communications Network at Cape Canaveral was to transmit the film to Alpha Centauri. Keanu Reeves and Scott Derrickson on film promotion in Mexico. December 12, 2008. Metacritic, a film review aggregator, gave the film a 40/100 approval rating based on 34 reviews by top rated reviewers, placing it in the "mixed reviews" category. Based on 186 reviews collected by Rotten Tomatoes, only 21% of them were positive. The majority found the film "heavy on special effects, but without a coherent story at its base, [the film] is a subpar re-imagining of the 1951 science-fiction classic." Bruce Paterson of the Australian Film Critics Association gave the film 3 out of 5 stars, writing that the generally poor reception for the film was "a sad fate for a surprisingly sincere tribute to Robert Wise's 1951 classic." Kenneth Turan of the Los Angeles Times 'congratulated' Keanu Reeves's performance and wrote in his review that "This contemporary remake of the science-fiction classic knew what it was doing when it cast Keanu Reeves, the movies' greatest stone face since Buster Keaton." A. O. Scott of The New York Times was not impressed with Reeves' performance, commenting that "even Klaatu looks bored and distracted, much as he did back when we knew him as Neo." William Arnold of the Seattle Post-Intelligencer gave the film a B minus and wrote, "It's a decent enough stab at being what the old movie was to its time, following the same basic plot, full of respectful references to its model, updated with a gallery of fairly imaginative special effects." Roger Ebert of the Chicago Sun-Times gave the film two stars and noted that the film had "taken its title so seriously that the plot stands still along with it", but also stated that it was "an expensive, good-looking film that is well-made by Scott Derrickson". Claudia Puig of USA Today gave the film two stars and wrote in her review she felt the film was "musty and derivative" and thought its only bright spot was 10-year-old Jaden Smith's "engaging, lively performance". At the 2009 Razzie Awards, the film was nominated for Worst Prequel, Remake, Rip-off or Sequel, but lost the award to Indiana Jones and the Kingdom of the Crystal Skull. The film was nominated in the category of "Best Single Visual Effect of the Year" at the 7th Visual Effects Society Awards but lost to The Curious Case of Benjamin Button. The Day the Earth Stood Still opened in North America on December 12, 2008. During that opening weekend, and despite poor response from critics, the film reached the #1 spot, grossing $30,480,153 from 3,560 theaters with an $8,562 average per theater. Out of the film's opening weekend income, 12% was from IMAX; it was "the highest IMAX share yet for a two-dimensional title". In 2008, it was the 27th highest-grossing film during its opening weekend but 40th for the entire year. The Day the Earth Stood Still was able to stay in the top 10 for its first four weeks in theaters. The film ended up grossing $79,366,978 domestically and $153,726,881 in foreign markets, a total of $233,093,859. The Day the Earth Stood Still was released on DVD and Blu-ray on April 7, 2009, almost four months after its release and only five days after its theater run ended. Bonus features include commentary with Scarpa along with a picture-in-picture showing the special effects footage, concept art, and photos. It also includes several featurettes: "Build Your Own Gort", "Re-Imagining The Day", "Unleashing Gort", "Watching the Skies: In Search of Extraterrestrial Life", and "The Day the Earth was Green." Also included were three still galleries and the film's trailer. Packaged with the film on a separate disc, is the original 1951 film. The Blu-ray release features a D-BOX motion code. According to data by Home Media Magazine, it came in first for rentals during its first and second weeks. For the first week of its release it was ranked first in Blu-ray sales, and second on the regular DVD sales chart, behind Bedtime Stories, totaling $14,650,377 (not including Blu-ray). ^ "The Day the Earth Stood Still (12A)". British Board of Film Classification. November 19, 2008. Retrieved September 21, 2016. ^ a b c d e "The Day the Earth Stood Still (2008)". Box Office Mojo. Retrieved 2009-04-20. ^ a b "20th Century Fox Stops the World to Beam The Day The Earth Stood Still into Deep Space" (Press release). MarketWatch. 2008-12-09. Retrieved 2008-12-09. ^ "The Day the Earth Stood Still: The IMAX Experience". 2008-12-09. Archived from the original (Website announcement) on December 5, 2008. Retrieved 2008-12-09. ^ a b "The Day the Earth Stood Still Movie Reviews, Pictures". Rotten Tomatoes. Retrieved 2008-12-17. ^ a b Damon Wise (December 2008). "Keanu Barada Nikto". Empire. pp. 143–149. ^ Dennis Lim (2008-12-07). "Keanu Reeves' freaky flights of fancy". Los Angeles Times. Retrieved 2008-12-06. ^ Steve Biodrowsk (2008-12-06). "Day the Earth Stood Still - Preview". Cinefantastique. Retrieved 2008-12-08. ^ a b c d e f g h i "Production notes" (PDF). 20th Century Fox. Retrieved 2008-11-21. ^ a b Shawn Adler (2008-07-04). "'The Day The Earth Stood Still' Trailer Is Here!". MTV Movies Blog. Retrieved 2008-07-05. ^ a b Cindy White (November 17, 2008). "On Set: Day The Earth Stood Still". SCI FI Wire. Archived from the original on July 28, 2011. Retrieved November 17, 2008. ^ "Q&A: More Earth Spoilers". SCI FI Wire. 2008-12-10. Archived from the original on 2009-07-11. Retrieved 2008-12-10. ^ Seth Shostak (2008-12-08). "On the Set of The Day the Earth Stood Still". LiveScience. Imaginova. Retrieved 2008-12-08. ^ a b c Ryan Rotten (2008-11-17). "The Day the Earth Stood Still Set Visit Q & A". ComingSoon.net. Retrieved 2008-11-17. ^ Paulington James Christensen (2008-11-17). "Keanu Reeves and Jennifer Connelly Prepare Us for The Day the Earth Stood Still!". MovieWeb. Retrieved 2008-11-17. ^ a b c d e Ryan Rotten (2008-11-17). "The Day the Earth Stood Still Set Visit Q & A". ComingSoon.net. Retrieved 2008-11-17. ^ a b c d e f Matt Mueller (December 2008). "Excellent adventure, or bogus journey?". Total Film. pp. 68–72. ^ a b c d e f g h i j k "Production notes". 20th Century Fox. Retrieved 2014-10-08. ^ Scott Brown (2008-11-25). "The Looming Deluge of Eco-Disaster Flicks". Wired. Retrieved 2008-11-25. ^ Alistair Harkness (2008-12-05). "Director Scott Derrickson tells why he agreed to reinvent The Day The Earth Stood Still for the modern era". The Scotsman. Archived from the original on December 6, 2008. Retrieved 2008-12-05. ^ a b c d e Ryan Rotten (2008-11-17). "Set Visit: The Day the Earth Stood Still". ComingSoon.net. Retrieved 2008-11-17. ^ George Rousch (2008-12-09). "Exclusive Interview: 1-1 With Day The Earth Stood Still Director Scott Derrickson". Latino Review. Archived from the original on 2008-12-11. Retrieved 2008-12-10. ^ a b Seth Shostak (2008-12-08). "On the Set of The Day the Earth Stood Still". Space.com. Imaginova. Retrieved 2008-12-08. ^ "Film Production Chart". Variety. Archived from the original on October 2, 2008. Retrieved 2008-07-05. ^ Pamela McClintock (2007-09-26). "'Transformers' sequel sets 2009 date". Variety. Retrieved 2007-10-05. ^ Heather Newgen (2008-12-10). "Making the Earth Stand Still". ComingSoon.net. Retrieved 2008-12-10. ^ "No Gort!! No "Klaatu Barada Nikto"!! Uncapie Goes Postal On THE DAY THE EARTH STOOD STILL Remake Script!!". Ain't It Cool News. Retrieved 2008-07-05. ^ Larson, Randall (2008-12-31). "Tyler Bates on Score Day the Earth Stood Still". Cinefantastique. Retrieved 2009-05-07. ^ Patrick Lee (December 12, 2008). "Q&A: Earth's Director". Syfy. Archived from the original on October 27, 2010. Retrieved 2008-12-12. ^ "The Day the Earth Stood Still - Soundtrack". IMDb. Archived from the original on 13 December 2015. Retrieved 2 March 2017. ^ Gregg Kilday (2008-11-30). "Int'l Press Academy announces nominations". The Hollywood Reporter. Archived from the original on December 7, 2008. Retrieved 2008-12-03. ^ "The Big Screen". Cinephilia. Retrieved 2008-12-31. ^ Turan, Kenneth (2008-12-12). "Review: 'The Day the Earth Stood Still' - Los Angeles Times". Los Angeles Times. Retrieved 2008-12-14. ^ Scott, A. O. (2008-12-12). 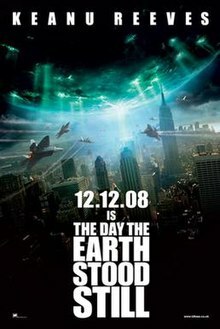 "Review: 'The Day the Earth Stood Still (2008) - It's All Over Earthlings (Don't Flee to New Jersey)' - New York Times". New York Times. Retrieved 2008-12-14. ^ Arnold, William (2008-12-11). "'The Day the Earth Stood Still:' Timing gives sci-fi remake a fighting chance". Seattle Post-Intelligencer. Retrieved 2008-12-14. ^ "The Day the Earth Stood Still Review - Roger Ebert". Chicago Sun-Times. 2008-12-10. Retrieved 2008-12-14. ^ Puig, Claudia (2008-12-14). "'The Day the Earth Stood Still' doesn't do original justice". USA Today. Retrieved 2008-12-14. ^ Gray, Brandon (December 15, 2008). "'The Day the Earth' Stalls". Box Office Mojo. Retrieved 2009-05-06. ^ "The Day the Earth Stood Still Box Office Summary". Rotten Tomatoes. Archived from the original on 2009-02-21. Retrieved 2009-04-21. ^ Liebman, Martin (April 8, 2009). "The Day the Earth Stood still blu-ray Review". Blu-Ray.com. Retrieved 2009-04-27. ^ "The Day the Earth Stood Still". The Numbers website. Retrieved 2009-04-27. This page was last edited on 17 April 2019, at 00:47 (UTC).